How will the Zika virus affect MLB spring training? With teams set to report to spring training in Florida this week, what preparations should fans make to protect themselves from the Zika virus? WASHINGTON — As scientists around the world race to grasp an understanding of the Zika virus’s potential effects, Major League Baseball will see its teams open spring training this week. For half of the teams’ players, families, staff and fans — including both the Nationals and Orioles — that means a seven-week stay in Florida, where the governor has declared a state of emergency and the conditions are ripe for the potential spread of the virus. There is still much to learn about Zika, which may be connected to birth defect microcephaly in pregnant women and a rise in the rare Guillian-Barre syndrome, which can cause temporary paralysis. So how worried should fans thinking of making the trip to Florida be, and what precautions should they take once they get there? “Right now, there’s no local transmission of infection in the continental United States,” says Dr. Anthony Fauci, director of the National Institute of Allergy and Infectious Diseases at the National Institutes of Health. Local transmission entails a person who has left the country coming back to the U.S. and being bit by a mosquito who then bites another person and infects them. Fauci says there have been similar such localized infections in the past in both Florida and Texas with diseases such as dengue, but they have been quickly eradicated. Major League Baseball has been in touch with the Center for Disease Control and has been in touch with its member clubs about how to prepare for spring training. “We have communicated CDC recommendations to our Clubs and MLB employees and have provided factual information, including symptom identification and best practices on prevention,” a league spokesman tells WTOP. An email to the Orioles to see what kind of information the team planned to disseminate to fans had not been returned as of publication. 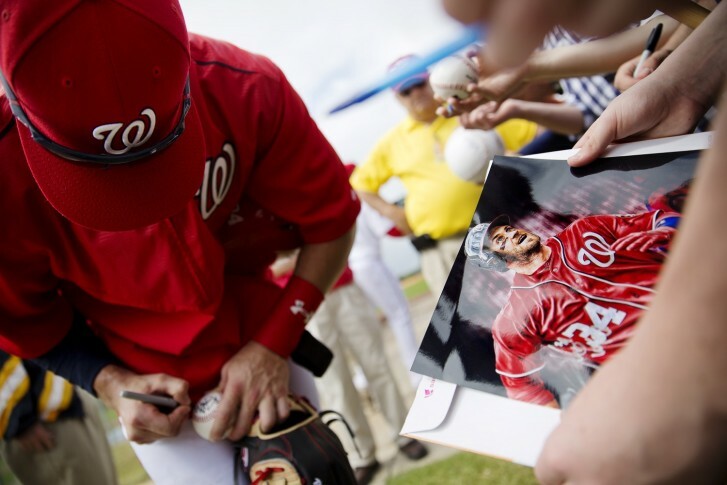 The Nationals did not offer any specific recommendations, instead referring fans to the local public health office. “The Washington Nationals are encouraging fans who have concerns or questions to call the Florida Department of Health’s Zika Virus Information Hotline at 1-855-622-6735,” says a team representative. Fauci’s advice to anyone planning to travel to Florida is simply to protect themselves as they would in any place with mosquitoes, by wearing proper clothing and using insect repellent. He also advises that clubs should take as much precaution as possible at their facilities to avoid fostering conditions that could lead to heavier mosquito activity. “Make sure there’s no standing water around where mosquitoes could easily breed,” he says. However, Fauci doesn’t think that the risk at this point is such that any fans should cancel their trips to Florida, if they’ve already made them.